On one hand, there are people who bust their butts working year after year … slaving away for bosses and managers who don’t appreciate them … to earn a paycheck that does little more than pay the bills. But then on the other hand, there are those who seem to have found a better way. I’m talking about people who live life on their own terms. They’re people who have all the money they need, yet they seem to work when they want to … where they want to … for whom they want to. What’s more, they have all the free time in the world to travel … to spend with their kids … to lower their golf scores … to really enjoy life. For these people, the idea of hourly wages, annual cost of living raises, and having to “be at your desk by 8 a.m.” are as foreign as the workaday world they left behind. Where you can afford to help your son or daughter buy the newer car loaded with the latest safety features, instead of that older model that could break down anywhere. Where the biggest problem about doing a home renovation or adding a pool is not affording it – but finding the right people to do it. You may know some of these people. And my guess is … you’d like to be just like them. In fact, I know you can. I’m living proof of it. I learned the simple secrets to writing the kind of letter you’re reading right now. Now I “work” a few hours a day. I write one, maybe two letters a month. About a decade ago, I moved from crowded and too-hot-for-me Florida to a little historic town in the Vermont countryside. I have no bosses, no commute. I write from an extra room I set up in my home. Some days, I’ll head to the little writing studio I decided to rent in the heart of town, just for a change of scenery. For a break, I’ll walk over to the old Equinox Resort for lunch … grab a coffee at the local market … or take our new puppy, Yukon, over to Hildene Meadows for a run. I absolutely love the freedom of it! My neighbors think I’ve taken early retirement – probably because they never see me working. In many ways, I have retired. Because, for the first time in my life, I decide how my days will be spent. Some days, I’ll feel like working for a few hours (typically in the morning). Other days, I’ll play some golf, tennis, ski … or just hang out with my 13-year-old son. But what surprises people most (and may surprise you, too) is the income my “retirement” lifestyle gives me: around $300,000 a year. It all stems from my ability to sit down and write (some would say “rattle off”) a simple letter like the one you’re reading now. Anyone who likes to write can learn the same skill that lets us earn a very comfortable six-figure income from home, year after year. It’s a skill that –– once you have it –– will put your financial destiny squarely in your own hands, for as long as you choose to use it. You’ll be in constant demand. You’ll never be wanting for work or money, no matter what state the economy is in. Along the way, you’ll learn much about yourself, about business, and about the world around you. And depending on who your clients are, you’ll get some nice perks as well. I’ve been on dozens of trips over the years – Barbados, France, Spain, and beautiful five-star resorts throughout Canada and the States. My last trip was a seven-day cruise aboard a Crystal Cruise ship, the “Ritz-Carlton” of cruise ship travel. And since I actually worked on these trips, I paid for none of them. But more than anything else, it’s an opportunity to “reinvent” yourself … and learn a financially valuable skill that will quickly lift you above any economic fray … forever. What’s more, you can use this new skill in so many ways. Use it to turn a hobby or personal passion into a fun and lucrative career. Use it to help find a cure for cancer or help those in distress. Use it to start your own business (for practically nothing) –– or work in a field you’ve always dreamed of. And what a blast it is! This life of sitting back with a laptop telling people about things you love and believe in – and being paid very well to do it. Once you have this skill, you can do and accomplish anything. I know. Like I said, I went from a $6.50 per hour grocery store shelf stocker to a six-figure income earner in about a year. And I’m not the only one. Many folks have discovered this amazing little opportunity … just like you’re about to do today. Get paid $210,000 to write 12 letters? It can (and does) happen. A writer with an established track record can command $8,000 per letter. So 12 letters pays $96,000 in writing fees alone. Now let’s say six of those letters become “controls” — which means they bring in the most money and keep mailing time after time. If, over the course of a year, each of those six letters mails five or six times, your royalties can add up to another $120,000. That’s over $210,000 a year writing one letter a month! More letters = more writing fees. More controls = more royalties! And all you need to enjoy this success is a computer … a desk … and AWAI’s Accelerated Program for Six-Figure Copywriting to show you the way! That writing simple, conversational letters like the one you’re reading now can pay so well. But, as you’ll learn by reading on, letters like this one serve as the foundation of a $2.3 trillion industry that –– thanks to the Internet and online marketing –– is growing faster than ever. In fact, some of the biggest growth occurred in the last three years – during a time when the “traditional economy” struggled mightily. And the demand is now so enormous that, as soon as I finish writing this letter, I can make a phone call (or send off an email) to one of my clients –– and have five new projects to choose from … each worth anywhere from $10,000 to $50,000 in potential income to me. I’m not bragging. That’s just the way it is when you can write one of these letters. There’s so much demand that no marketer in his or her right mind would pass up the opportunity to have another winning letter ready to mail! After all, a good letter can generate millions in sales over the course of a month. So why wouldn’t they be happy to pay you $6,000 to $10,000 and a cut of the action? And it’s very easy to learn how to write these letters. In no time, I was writing letters that were pulling in millions of dollars! But first, is this opportunity for you? If you’re someone who needs the structure of a 9-to-5 job or thrives in an office environment, then you’re probably not going to embrace the kind of “do-what-you-like-when-you-like” lifestyle that comes with letter writing. And that’s fine. There’s no single “fit” for everyone. Or if you’re just sick of not living up to your potential in life – and you feel like the time to make any real changes is quickly slipping away. Then my hunch is that this opportunity is ideal for you. It really is a chance to “take back your life” – from the corporate world, from the bosses who decide your day for you, from rush-hour traffic, from the headaches, pressures, and (these days, especially) the job insecurity that comes with the workaday life. This is not a “get rich quick” proposition. It doesn’t have anything to do with wacky chain letters … or any kind of multi-level marketing scheme … or placing ads … or buying products and having to resell them on your own. This is a very serious opportunity to learn a highly marketable and lucrative skill that – once you have it – can put you in high demand by some of the biggest companies in the world … and provide you with a six-figure annual income for the rest of your life! Success won’t be automatic. Nobody will do it for you. You’ll need to know what elements go into every successful letter, and you’ll have to make the effort to learn them. That said, once you have this skill, you’ll have unlimited potential. Whether you want to make a nice little side income helping local businesses make more sales – or launch your own multimillion-dollar direct-response enterprise … this skill will help you do it. Now I know it may be hard to believe that you can make so much money and change your life so dramatically by knowing the secret to writing a simple letter like this one … and being able to do it on your own terms … from anywhere in the world. Some of the best writers in our business have no formal writing background at all. They just love to write … and they learned the secret formula for writing great letters. If you enjoy writing, you too can have this “dream” lifestyle – just by learning the few powerful secrets that make these simple letters successful. In fact, if you spend a few more minutes with me today, I’ll tell you everything you need to know about this amazing, yet little-known, niche of the writing industry … where you can “retire” from the job you have now … and earn more money than most doctors, lawyers, or other well-schooled professionals. Most people think that to be a successful writer you have to be born with a special talent … study the classics … amass a huge vocabulary … and know all the rules of English grammar, usage, etc. To be a great copywriter, you just have to enjoy writing — and understand the simple rules that go into making strong copy. And the number one rule is: Be Yourself! In other words, don’t try to be a writer. Don’t use big words, flowery sentences, or fancy prose. Don’t try to be clever — and avoid clichés at all costs. The most successful sales letters are written in a very conversational tone — almost like you’re talking to a friend. In fact, one of the secrets you’ll learn in AWAI’s Accelerated Program for Six-Figure Copywriting is “the barstool test,” where you read something you’ve written aloud … and if it sounds like something you’d say to a friend sitting next to you — it’ll work as sales letter copy! Once you can write in a conversational tone, it’s just a matter of knowing what to say when. Of course AWAI’s Accelerated Program for Six-Figure Copywriting will show you everything — and it’s jam-packed with tips and techniques designed to make every paragraph you write more effective and powerful. And be sure to pay special attention to “The Architecture of Persuasion,” explanation you’ll find in Part 3 Read it and you’ll understand in an instant what great copywriting is all about. My name is Paul Hollingshead. I’d hate to think what my life would be like had I not come across this opportunity – like you have today. Imagine – working for near minimum wage – and soon to be fired from the job! That’s when I met the gentleman I’m going to introduce you to today – a man who literally changed my life. I went from no money and no future to living a dream lifestyle where I can earn virtually as much money as I want to make. If I know I’m going to need an extra $20,000 to, say, rent a summer beach house, I’ll merely sit down and write a couple of letters. If I want to put a new kitchen in our house (which we did recently) and need $50,000 to do it … I’ll set aside a month or two and write five quick letters. It takes most people with ordinary jobs years to save that kind of money (or they go into debt to get it). But I can have it in a month or two. That’s because I know any letter I write will earn me at least $10,000 … likely much more. You just decide how much you need and figure out how many letters you need to write. It’s like having a little wealth dial you can turn as high as you want! Let me explain to you how the business I’m in works – and why companies are so willing to pay me big dollars to write a letter like this one. Just What Is “Direct Response” Anyway? So what is “direct-response” marketing – and how is it different from other advertising? Unlike the “image” or brand advertising that you see in newspapers and magazines, direct-response is any kind of advertisement or letter that asks you to take an immediate and specific action – whether it’s to order the product right then and there or request more information about it. Companies use direct response to sell everything from mattresses to financial newsletters … from health supplements to fruit baskets. Non-profits raise billions using direct-response techniques, too – from political candidates to environmental organizations to children’s aide groups. And let’s not forget the multibillion-dollar business-to-business market, one of the most lucrative and in-demand niches of the direct-response industry for copywriters. All of them use direct response because a well-written letter can bring in millions of dollars – for a fraction of the cost of opening a storefront or selling wholesale to retailers. Direct-response marketing allows companies to reach the people and businesses most likely to buy their products … simply by sending letters and emails to those who have shown an interest in similar products in the past. But a direct-response promotion is nothing without the right words. It needs to convey the right message … say the right things … be structured in the right way … and be written to make the prospective buyer take action. And these days, more and more selling is done online. Through websites, emails, landing pages, discussion boards and forums – even through the pages of well-known social media sites like LinkedIn, Facebook, and Twitter … and lesser known ones like Instagram, MyLife, Ning, PLaxo, XING, and others. That’s where the copywriter comes in. “In 2003, I had advanced to a point in my sales career where weekly travel was inevitable. I was at the top of my field, earning a great living. But as a new dad, I didn’t want to be away from home all the time. Plus, I was getting tired of continually rising quotas – an inevitable reality when you’re in sales. Eleven years of chasing numbers had worn me out. I was ready for a change. Yet I didn’t want to sacrifice my high income and my family’s financial future. Either way, copywriters are paid very well to write them – because the best ones know the simple secrets to making a direct-response sales letter work. For that reason alone, they’re in very high demand … and are paid very well for their services. It’s quite possible for a copywriter to live very nicely off just one successful letter per year. That’s because you’re not only paid a handsome fee to write the letter (anywhere from $3,000 to $12,000, depending on the job and the reputation you’ve built up), you can be paid royalties too. Royalties work for a copywriter much like they do for a fiction writer who writes a bestselling book. And once this very close-knit industry finds out you can write winning copy – your phone won’t stop ringing! … royalties could put an additional $50,000 to $300,000 in your pocket! That’s between $80,000 and $540,000 a year – depending on how many letters you choose to write! Did you ever think writing simple, personal letters like this one could be so lucrative? Neither did I until I met the gentleman you’ll meet now – the man who will be instrumental in helping you grab your share of the tremendous wealth you can earn by writing simple letters like this one. His name is Mark Ford… and he’s the one who helped transform me from a minimum-wage grocery store stock boy to a professional, in-demand copywriter earning upward of $300,000 a year … writing a few hours a day … living my life very much on my own terms. Through his efforts, Mark has helped dozens of companies grow into multimillion-dollar enterprises. Among them, Agora Publishing, which was an $8 million direct-response business before he started giving them his copywriting and marketing advice. Today, it’s one of the largest direct-response publishers in the country, with over $350 million in sales (and always looking for new writers!). Mark’s talent and skill have allowed him to create an impressive lifestyle for himself and his family … while spending more and more of his time on charitable endeavors, both in the U.S. and abroad. But what’s really important for you to know – is that Mark takes great pride in the fact that he’s been able to pass on his knowledge to so many. The copywriters he’s trained (me included) have been responsible for over a billion dollars’ worth of direct-response sales through the mail and online. Naturally, I’m thrilled to have been one of his many students. There’s no way I could have the success I’m enjoying had it not been for Mark Ford sharing the powerful copywriting tips, techniques, and strategies he’s generously given me over the years. In AWAI’s Accelerated Program for Six-Figure Copywriting, there’s a section marked “Your $10K Challenge.” It includes everything you need to write a sales letter for the very program you’re taking. You’ll find industry stats, program information, details, facts, testimonials – the whole bit. Set it aside. (Some members tell us they print it out and tape it to a wall near their desk for “inspiration and motivation.”) Work your way through the program. Learn how a sales letter is structured. Soak in all the copywriting secrets and strategies. And when you feel you’re ready, start working on your letter. And when you’ve got it just right – send it in. If it’s good (or even if it just needs a little help) – we’ll test it. If it beats our “control” letter – or performs well enough to re-mail – we’ll pay you $10,000! 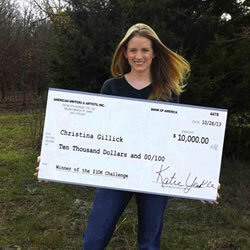 Christina Gillick won our $10K Challenge in 2013. Today, she's a happy freelancer living her version of the writer's life. Who knows, you could be next – and earn $10,000 before you even finish the program! – Christina Gillick, AWAI member and working copywriter. Don Mahoney was a cabinetmaker barely eking out a living in upstate New York, getting sicker and sicker from the lacquer fumes and other chemicals he�d breathe in every day. A year after learning Mark�s secrets, he moved to Florida and started writing copy eventually earning $300,000 writing letters from his Miami Beach home. Frank Stands used the copywriting skills Mark taught him to build a $40 million per year publishing empire – and another Ford protégé that Frank hired to oversee his marketing operations, Mark Potter, earns upwards of $750,000 a year writing and helping others write letters. John Forde and Will Pratt were kids just out of college when they met Mark Ford and learned his secrets. Young and full of adventure – they took their laptops and their six-figure copywriters’ incomes to Europe a few years ago … and never came back! Karen Tyler came to work for Mark as a copy editor right after she graduated from college. Today, thanks to the skills she learned from him, she’s a partner in a direct-marketing company that generates over $5 million in sales annually. Now before I tell you how you can add your name to this list … here’s a confession. As generous as Mark is with his knowledge … and as much as he loves it when people he helps go on to successful careers in writing and business – it’s not like Mark doesn’t win on the deal too. That’s because many of the people he’s helped go on to write letters for companies in which he’s involved or has a financial interest. And when you consider that the letters those folks have written have likely sold billions of dollars’ worth of products and services over the years, everyone wins! So you see, Mark – along with thousands of other publishers, marketers and Web-based business owners – has a vested interest in seeing there are plenty of qualified writers who can write the millions of letters and online content needed to drive this enormous industry. Once you understand how this industry works, the sky is literally the limit! Once you understand the power of persuasive writing – and come to learn the secrets of unleashing it in your own business – you can make literally millions of dollars, year after year, for as long as you choose to use it. That is not a pipe dream. It’s a fact. I know people who have and are doing it. Like my friend Don, who launched an online natural health business – and Peter, who started in this business when I did, and now makes $2 million to $3 million per year in the information publishing business. Because, as with anything, there’s always a first step to take. And in our business, that’s mastering the art of persuasive writing and learning all the powerful copywriting secrets Mark Ford – and some of the other top copywriters in the industry – know and use. Secrets that can take you from wherever you are today – and transform you into a writer living “the charmed life,” earning top dollar and having as much (or as little) free time as you desire. You’ll learn who all the players in the industry are … who’s looking for writers (practically everyone!) … who pays top dollar … and the best companies to write for. We’ll even help you get started – by showing you surefire ways to land your first assignment and launch your six-figure copywriting career. We’ll show you how to get the attention of marketing people who are looking for copywriters. Plus, you’ll have an opportunity to write a letter for us. And if your letter’s a winner, we’ll give you a professional writing contract for $10,000. But before I tell you just how we plan to put all this incredible information at your fingertips, let me explain how and why this enormous opportunity has landed in your lap today. One day, over a steak dinner, Mark was lamenting to me and Don Mahoney (the guy I mentioned earlier who Mark snatched from the road to nowhere … and who went on to earn over $300,000 as oneof the country’s top copywriters) about how his clients have all these products to promote but no one to write the letters. “There are just no copywriters available,” he told us. “They’re all backed up with work. I wish I could clone you guys,” he joked. If Mark could successfully teach Don and me – a small-town cabinetmaker and an on-the-outs grocery clerk – to write winning copy, why couldn’t he show anyone willing to learn how to do the same thing? That’s when it hit us. Why not put all the copywriting secrets Mark has amassed over the years into a thorough, concise, “learn-as-you-go” program – and offer it via the business we know best: direct response! We went to work immediately. First, we gathered all our best copywriting secrets – secrets Mark, Don, and I had used to sell billions of dollars’ worth of products and services over our combined 50 years of experience. We studied successful direct mail from all sectors of the industry – retail products, business-to-business, fundraising, subscription letters, financial newsletters, health products, and more. We contacted dozens of the world’s top copywriters and industry experts for their best writing and selling techniques. Armed with literally hundreds of the industry’s most powerful copywriting secrets, we went to work organizing and incorporating them into a step-by-step program for writing powerful direct-response letters – from captivating, attention-grabbing headlines … to irresistible offers … and everything in between. We divided the secrets into two categories: “Core” elements every successful letter needs to have, and “Master” secrets you can use to ratchet up the effectiveness of any letter you sit down to write. But besides cramming the program full of the most powerful copywriting techniques on earth, we also made sure the material was easy to learn and fun to do. Most important, though, we worked extra hard to create a program that anyone with even the most basic writing skills could succeed with. The past five years, for instance, we’ve focused on incorporating all the secrets to successful Web marketing into the program. Of course, it didn’t hurt that one of the companies many of the professionals associated with AWAI write for – myself included – was one of the first direct-marketing companies in the world to successfully “crack” the online and email marketing code … and develop an online marketing formula companies all over the world use every single day. We’ve aligned ourselves with experts in the lucrative world of business-to-business marketing, search engine optimization, social media marketing – even such small, but still highly lucrative, writing niches as grant writing and professional research. And over the years, we’ve done exactly what we set out to do: help thousands of folks change their lives by becoming professional writers. But as excited as we are about all the success stories we can talk about, it’s the industry’s response to the program that really took us by surprise. As good as it was when it debuted, AWAI’s Accelerated Program for Six-Figure Copywriting is even better today. Over the years – the program has been updated, revised, retooled, and added to. New secrets … current techniques … everything you need to be a successful copywriter in today’s Internet world. And the demand for new copywriters? That’s why, if you’re looking to learn a powerful, income-generating skill that will last you a lifetime, AWAI’s Accelerated Program for Six-Figure Copywriting will give you every opportunity to succeed right away in this very exciting, highly lucrative business of letter writing. “Most copywriters will tell you there are proven, specific techniques behind the art of persuasion. The same ideas that hide behind the ‘junk mail’ you find in your mailbox everyday are the same ideas you can use to boost your query letters and grab an editor’s attention. AWAI has not only uncovered these secrets, but they’ve managed to put them all together in an easy to follow program. You’ll learn a fast and surefire system for getting all your research and letter-writing ammunition organized … as well as one master’s technique for getting to know the product you’re selling even better than the people who created it. You’ll learn how to write masterful headlines that grab your readers’ attention and force them to keep on reading. You’ll learn the four-part structure of every sales letter. Once you know it – and understand what each part must accomplish – it’s just a matter of filling in the blanks. You’ll learn the secret to a powerful lead – an opening so irresistible that your reader will want to buy what you’re selling after reading the first two pages. You’ll learn the secret of “The Four-Legged-Stool.” Use it faithfully and you’ll never write a bad letter. You’ll learn “The Architecture of Persuasion” – Mark’s innovative technique for knowing how every successful letter needs to be structured … and the surest way to lead your reader to the sale. You’ll learn how to “speak” directly to your reader … and show that you truly care about his or her worries, needs, and wants. It’s amazing how many letters don’t do this … and fail. You’ll learn how to critique your own work … and a “power-editing” technique that will guarantee your letter is the strongest it can be, time after time. You’ll learn the secret to creating powerful “bullet copy” … purposeful subheads … eye-catching envelope copy … and an order form that’s virtually assured to clinch the sale. Although professional artists will design your letters, you’ll learn the key elements of winning graphics – and the biggest design mistakes that can sabotage even the best copy. You’ll learn how to get yourself “seeded” … so you can see everything that’s mailing and know what’s working and what’s not. You’ll learn all these and many, many more powerful writing secrets, selling techniques, and masterful insights into the art of persuasion … from some of the best copywriting minds in the business. The barstool test is one of the most powerful secrets for writing great sales letters, because it ensures a strong, personal rapport with your reader. That’s why one of the first things you’ll learn when you take the AWAI program is to forget everything you’ve learned about traditional writing … and just write the way you’d talk to a friend about something you’re passionate about! But as jam-packed with writing secrets as the program is, it’s just one aspect of your copywriting learning experience. AWAI will not only prepare you for your new copywriting career but will show you how to launch it as well. For instance, as a member of AWAI’s Accelerated Program for Six-Figure Copywriting, you’ll immediately start receiving your FREE subscription to The Golden Thread – our weekly e-letter featuring writing tips, advice, success stories, and, yes, JOB OPPORTUNITIES. The Golden Thread will educate and motivate you. And it will be just one of many sources for finding paying assignments when the time comes for you to start writing for money. You’ll also be given access to AWAI’s Members-Only Website – where you can pick up even more tips and strategies … check out the latest job list … get answers to questions you may have … and search the over 1,500 articles archived there. There’s also the AWAI Member Forum, where AWAIers talk about their new copywriting careers, build friendships, and form copy circles and buddy groups. It’s a great place for like-minded people to meet and share ideas. Plus – and this is a biggie – there’s DirectResponseJobs.com, our exclusive Online Job Board, where marketers and writers come together. As I said, AWAI is more and more becoming the place the industry turns to for copywriters to write the volume of letters that need to be written. And with the industry’s demand for copywriters growing – and the reputation of our program and the members who complete it getting stronger – we knew we had to provide a way for marketers to place their job ads one day … and have a writer in place the next. DirectResponseJobs.com was the result. As an AWAIer, you’ll have full access to this service – and it’s free! All of this is meant to do two things for you: 1) prepare you to take your place among the top copywriters in the country, and 2) help you launch your copywriting career. Now I know this might sound like a lot to you. And it’s natural to feel a little overwhelmed by it all. But please understand that there’s a logical sequence to everything you do in AWAI’s Accelerated Program for Six-Figure Copywriting – and that it can all be done online, entirely at your own pace. Before you know it, you’re on your first writing exercise … putting into practice the same skills and knowledge the country’s top copywriters use every day to write powerful direct-response letters. Then you dig into the meat of the program … where you learn the basic structure of a sales letter – and what every letter needs in order to be successful. With that foundation in place, it’s just a matter of discovering, absorbing, and incorporating the powerful copy secrets that follow … each one designed to take your copywriting to the next highest level. You’ll even get an insider’s tour of the top markets that need copywriters … and client-finding resources that show you where to go and what to say so you can get hired right away. After all, remember why this program exists: Our industry needs writers … badly! And we want you to succeed. Because, guess what? Over the years, we’ve developed close relationships with some of the top direct-response companies in the country. They’ve seen the kind of letters AWAIers are capable of writing. And they’re more than happy to give our members an opportunity to write for them. The fact is, we have hundreds of letters on file (and lining our AWAI office walls – if you ever visit us, you’ll see them!) from members thrilled with the opportunity AWAI’s Accelerated Program for Six- Figure Copywriting has given them. “This past year alone, my company, Agora Publishing, paid out over $7 million in writing fees and royalties to a handful of copywriters. And I’m happy to do it … because a good letter is the ‘engine’ of my business. That’s why I’m always looking for more copywriters — lots more. There just aren’t enough to write the hundreds of letters my company needs written every year. And I’m not alone. The whole industry needs copywriters. And these are just a few of the letters we’ve received. More arrive every week. Bottom line is this. When you succeed, our industry succeeds. And when the industry sees the high level of writing coming from AWAI’sAccelerated Program for Six-Figure Copywriting members – we succeed too. But perhaps no one benefits more than you. Particularly if you’re at a point in your life where you’re just not happy with the job you’re in … with the money you make … or the strains and stress that come with the typical workaday life. If that’s the case, I’d love to see you give AWAI’s Accelerated Program for Six-Figure Copywriting a try. But, more importantly, you should do it for yourself. Warren Buffett, one of the smartest and most successful men of our time – and Medal of Freedom winner – was recently asked what he considered to be the best investment anyone could make in these challenging times. That could very well be the best advice Mr. Buffett has ever offered. There has never been a better time to put your future squarely in your own hands – and master a valuable skill that will forever be in demand … now and right through your retirement years. And not just because of this rare opportunity to learn a fun and life-transforming skill – one that can free up your lifestyle enough that you’re able to live like “carefree millionaires” do … and turn every day from here on out into an exciting adventure. Imagine having time to travel like you’ve always wanted … to finally take up that hobby you’ve always wanted to do … master that sport … or get into the best physical shape of your life. As a copywriter, you can have the time and the money to do it. But here’s why now is the ideal time to see if “the writer’s life” is the life for you. “The writing life – copywriting and writing in general – has been extremely good to me. A terrific way to make a living. And, as a ‘teacher.’ I’ve been helping businesspeople, entrepreneurs, authors, consultants, and others create their ideal business lives for decades. Through this special offer — you can actually access the entire program, and give it a try risk-free for just $99.25. You’ll get complete access to everything you need to live the writer’s life for a full 30 days. Take that time to look through the program … start the learning process … learn about the direct-response business … what the life of a work-from-anywhere, in-demand, highly paid copywriter is all about. If it’s not for you, let us know and we’ll simply (and immediately) deactivate your access code and refund your $99.25 – no questions asked. But if you want to continue with your copywriting training beyond the 30-day “try it out” period – and take advantage of all a lifetime of program updates, interactive learning opportunities, and ongoing access to writing jobs and industry news that are included – simply do nothing and we’ll elevate you from “provisional” to “full-time” copywriter status for a mere $397. We’ll even break up that final payment into four monthly payments of $99.25, which we’ll charge to your credit card for each of the four months following your 30-day trial. In other words, for a total of $497, you can be well on your way to learning and mastering a skill that can transform your life – and your income – in so many ways. You’ll get everything you need to live the writer’s life, including full online access to the program and the AWAI members-only website, all practice writing exercises, your email subscription to The Golden Thread, your access to DirectResponseJobs.com (where real marketers come looking for up-and-coming copywriters) and, of course, your invaluable Hall of Fame catalog book, packed with some of the most successful sales letters of all time. Even after your 30-day trial, we still want you to take a full year to get your writing career on track. And if it doesn’t happen – you pay nothing. Sign up for the program now for $99.25 and you’ll have full access to the program for the next 30 days. If you decide it’s not for you, let us know and we’ll refund your $99.25 in full – no questions asked. If you want to continue with the program and learn this invaluable skill, simply do nothing and on the 31st day of your membership, we’ll charge your credit card an additional $99.25, once a month, for the next four months. After that, you’re through paying. You’re a full member of AWAI’s Accelerated Program for Six-Figure Copywriting – with lifetime access to the online program and all the benefits that come with it (including ongoing updates and additions). Then take a full year to master the skills and grow your career. Work on the program and start landing clients. If it’s not everything you imagined – or if you happen to decide copywriting just isn’t for you – let Member Services know within that year and we’ll send you all your money back … all $497 of it … no questions asked. Why are we going to such great lengths to ensure you’re completely comfortable and satisfied with the opportunity we’re offering you today? It’s because one thing we’ve learned over 17 years of showing people how to become successful copywriters is that our reputation is only as good as the people whose careers we help launch. If you’re serious about a writing career, we’ll be here to help you master the skills whenever you need us. But if it turns out it’s not for you, the last thing we want is you left with that nagging feeling that you “wasted” your money. You can try it for very little money up front … and no risk whatsoever. Then take a full year to see if “the writer’s life” is for you – again, with absolutely zero risk. So if you’re ready to put the “workaday life” behind you – and choose a lifestyle that’s richer, freer, and infinitely more rewarding … get AWAI’s Accelerated Program for Six-Figure Copywriting through this very special “Test-Drive” offer today. Remember, there’s no risk for an entire year. And if you love it – and decide the writer’s life is for you – your very first letter could be the next one to rock the direct-response world … and lead to, among other things, a $10,000 writing contract from AWAI with your name on it. “That was two weeks ago. “Today, I have three new clients! “After getting a call this morning from a publisher, I was so happy I jumped up and down. You have to understand, this is a huge company that just doesn’t deal with small fries like me. “I couldn’t even call the marketing department, they don’t take cold calls. Period. And here I was getting a call – not from the marketing manager’s assistant, or even the manager … but the publisher himself – asking me if I’d be interested in writing for him! I decided I better wait before promoting myself anymore.